Interdigitated micro-electrode (IDµE) modified tin@tin oxide nanoparticles (Sn@SnO2 NPs) based gas sensor has been utilized for reversible detection of reducing gas molecules such as hydrogen (H2) and carbon monoxide (CO) at room temperature. 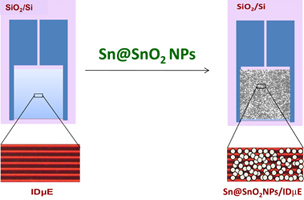 Sn@SnO2 NPs (1.5 µg and diameter of 5 nm) prepared using vapor phase condensation method was physically adsorbed uniformly onto the IDµE forming a gas-sensing medium. The nanoparticle sensor was subjected to varying gas concentrations (0.2 – 3%) of H2 and CO at room temperature and its response was observed by change in the resistance. Sn@SnO2 NPs/IDµE sensor exhibited maximum sensitivity of 41% and 26% for H2 and CO, respectively. The described gas sensor with high sensitivity at room temperature has potential for low cost portable commercial gas sensor for the screening of reducing gases. The main feature of this sensor is that the metal oxide sensor exhibits electrical response to reducing gases at room temperature without the need for any exotic metal catalysts.